This was unexpected, a freebie Flash-based role-playing aperitif from BioWare that's part Diablo, part Baldur's Gate, part "free prize inside!" 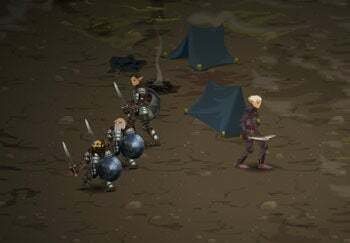 It's called Dragon Age Journeys, and it's a tactical RPG with stylish cartoon-style art squeezed between the margins of your average-sized browser window. Who says these guys aren't taking it the extra mile in the run up to Dragon Age Origins, their Godzilla-sized PC and console roleplaying game due in a few weeks? So the premise is kind of dull: You're a hero as opposed to "just some guy" (you're heroic because…well, because) exploring the underground dwarven kingdom of Moria…I mean Orzammar. Along the way, you'll uncover a "dastardly" plot that "threatens to unleash a great evil that won't stop until it destroys all living things." I know. Flash-based browser game. "Depth not included." On the other hand, the non-story stuff comes off as unusual for its complexity in this particular delivery medium. You can role up a gender-specific character, play as a human noble, dalish elf, city elf, dwarf noble, or dwarf commoner, and try for work as a warrior, mage, or rogue. You can tinker with hair styles, skin tone--even recolor your clothing. And that's just the creation bits. Once you're moving--literally moving by clicking your mouse around a two-dimensional display that harks back to the genre's halcyon years--you'll discover the wraparound interface looks like something you'd more expect from a full-featured RPG. 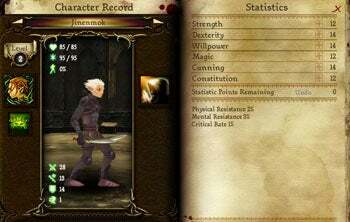 The character record chronicles advances in stats like willpower and cunning. Health, stamina, fatigue, weapon strength, and mental resistance variables are represented along with several others. 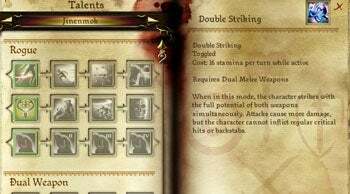 Spell and talent trees offer progression paths with allocation allowances, abilities with actual tactical import, like "dirty fighting" (stun target) or "advanced stealth" (reduce spotting) or "riposte" (dual-weapon attack with countering). An inventory screen lets you fiddle your accoutrements and combat handedness or view accessories and quest items, and a journal tracks your quests and keeps you oriented. Pretty impressive. You can drill on any of this stuff by way of tooltips that appear when you mouse over something. You can also save your game online--you can access up to three saves total--by logging into (or signing up for) an EA account. Gather a sufficient number of achievements by completing quests and you'll unlock special items that'll transfer over to Dragon Age Origins when it's released on November 3 for Xbox 360 and Windows PCs (the PlayStation 3 version follows later in November). When you bump into enemies (literally bump, that is) the game switches to a Heroes of Might & Magic style hex grid. 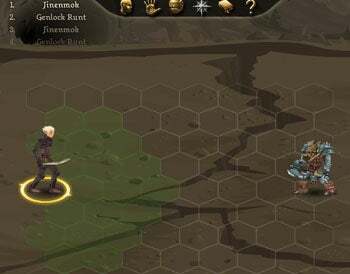 Tactical combat ensues in turns, allowing for ranged maneuvers (weapons, spells) and up to six angles of attack. It starts off simplistic enough--you move, they move, you swing, they swing--but as your character develops, it starts to exhibit the sort of nuance you'd expect from a full-blown tactical RPG. Depending on how much fiddling around you do, it takes an hour or two to complete. Then there's the remaining two installments--arriving in the next few weeks--to think about. Have a look over your lunch break or later this evening, if for no other reason than to see what's possible in a browser-based game: One that installs nothing, lets you save online, and loads in a matter of seconds.